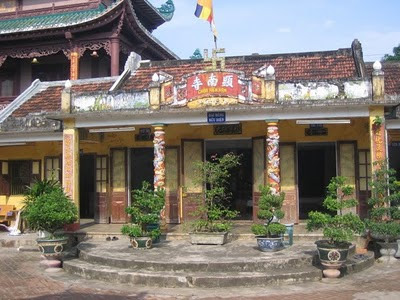 Chua Hien Nam is a 300 year-old temple in Quy Nhon City, Binh Dinh province. Like many temples in Vietnam, it is hemmed in all around by houses and shops, so the only way to reach the temple is by going down an alley. This has happened because over the years the temple has subdivided and sold off its lands, leaving itself stranded in the middle of urban density. 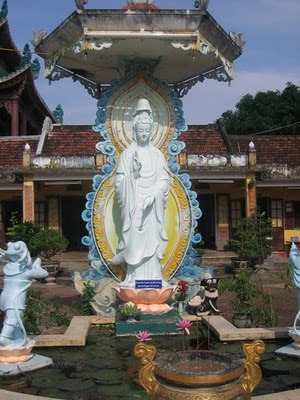 The grounds are still reasonably spacious, and the forecourt garden contains a large shrine to Kwan Yin. 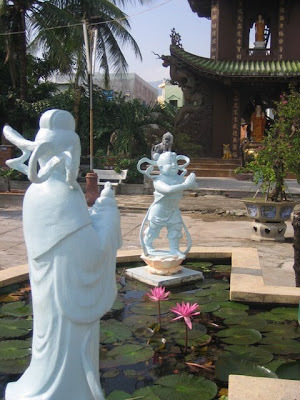 This outdoor shrine is above a water garden, growing some rather fine lotuses. The area is paved so that it can be used as an extension of worship or other congregational space. 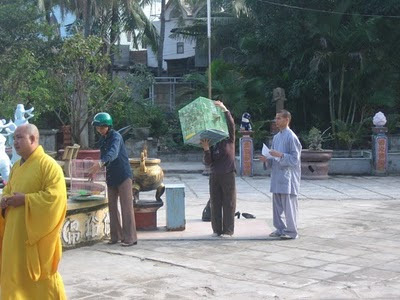 It is used all day by people from the surrounding neighbourhood - in this case to release a cage full of birds as an act of good karma. Looking out from the Abbott's room you can see his prize collection of bonsai in pots. The cultivation of bonsai - along with the cultivation of orchids - is seen as a monkish pasttime in Vietnam. 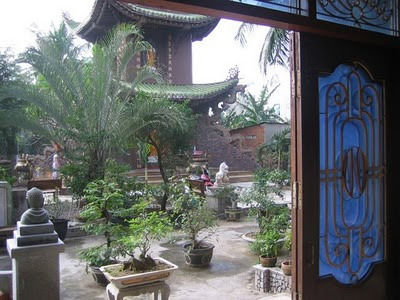 And though they provide an interesting focal point in front of the main prayer hall, they hardly provide any shade, which is much needed in Quy Nhon's hot climate.